There are 3 main roads leading directly to our store, we are VERY easy to get to!!!! 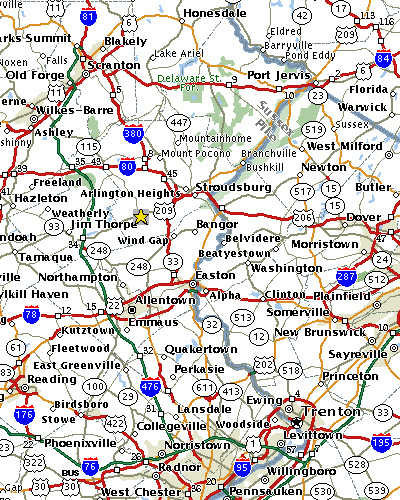 One of the easiest ways to obtain directions is through "mapquest.com", enter your destination as "rt 209 & Gilbert road", "Gilbert, PA 18331". OR Just use "rt 209, Gilbert PA 18331". Mapquest will plot your directions just about to our front door, as we are right in the center of the tiny town of Gilbert. There is one traffic light in Gilbert, and we're at that intersection! Feel free to call for more directions. Cross at Deleware Water Gap into PA, continue on I-80 to the Rt 33 south exit(about 7 miles), take 33 south to the Lehighton-209 south exit. Follow directions below. Take the Lehighton Rt. 209 South exit, proceed 7.5 miles on Rt. 209 south and we're on the left hand side. Big sign out front, bright orange letters "Wacky Worm". 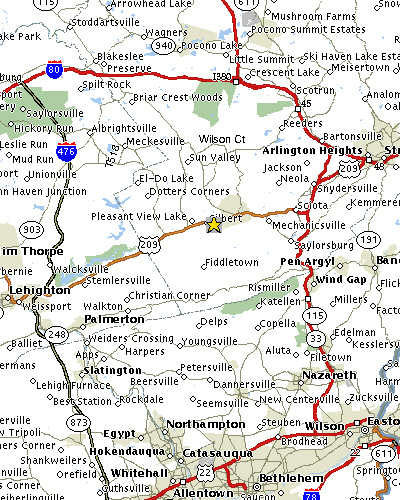 Cross into PA and continue on I-78 to 33 north, take 33 north to the Lehighton-209 south exit. Follow directions above. Take exit 74 (Mahoning Valley, Rt. 209), pay toll and take Rt. 209 North toward Stroudsburg. Proceed north 14 miles and we're on the right hand side. Take Blakeslee-rt 115 south exit(Same exit for Pocono Intl. Raceway). Follow directions below. Take 115 south past Pocono Raceway approx. 10 miles to the town of Effort. At the traffic light(intersection of Gilbert Rd.) turn right onto Gilbert Rd. Follow Gilbert Rd. to intersection of Rt. 209(traffic light), turn right onto Rt. 209, we're on the left hand side.